In order to protect company's information assets such as sensitive customer records, health care records, etc., the security practitioner first needs to find out: what needs protected, what risks those assets are exposed to, what controls are in place to offset those risks, and where to focus attention for risk treatment. This is the true value and purpose of information security risk assessments. Effective risk assessments are meant to provide a defendable analysis of residual risk associated with your key assets so that risk treatment options can be explored. 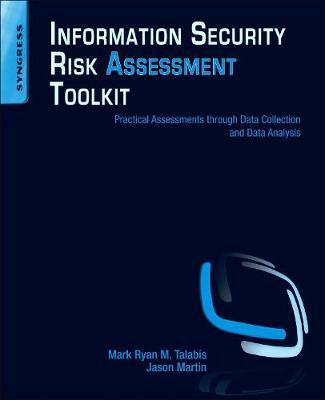 Information Security Risk Assessment Toolkit gives you the tools and skills to get a quick, reliable, and thorough risk assessment for key stakeholders. Mark Ryan Talabis is the Chief Threat Scientist of Zvelo Inc. Previously he was the Director of the Cloud Business Unit of FireEye Inc. He was also the Lead Researcher and VP of Secure DNA and was an Information Technology Consultant for the Office of Regional Economic Integration (OREI) of the Asian Development Bank (ADB). He is co-author of the book "Information Security Risk Assessment Toolkit: Practical Assessments through Data Collection and Data Analysis" from Syngress. He has presented in various security and academic conferences and organizations around the world including Blackhat, Defcon, Shakacon, INFORMS, INFRAGARD, ISSA, and ISACA. He has a number of published papers to his name in various peer-reviewed journals and is also an alumni member of the Honeynet Project.He has a Master of Liberal Arts Degree (ALM) in Information Technology from Harvard University and a Master of Science (MS) degree in Information Technology from Ateneo de Manila University. He holds several certifications including a Certified Information Systems Security Professional (CISSP); Certified Information Systems Auditor (CISA); and Certified in Risk and Information Systems Control (CRISC). Jason Martin is Vice President of Cloud Business for FireEye, Inc. the global leader in advanced threat detection technology. Prior to joining FireEye Jason was the President and CEO of Secure DNA (acquired by FireEye), a company that provided innovative security products and solutions to companies throughout Asia-Pacific and the US Mainland. Customers included Fortune 1000 companies, global government agencies, state and local governments, and private organizations of all sizes. Mr. Martin has over fifteen years of experience in Information Security, is a published author and speaker, and is the co-founder of the Shakacon Security Conference.